Now, Facebook is not only a social networking website rather it became a largest online marketing platform. People using facebook to stay in touch with friends along with to growing his business. Now a question may come in your mind that How Facebook helps to grow your business? if it is then how to create facebook page?…then the answer is ….Suppose you launched a company and you want to promote it without spending money. 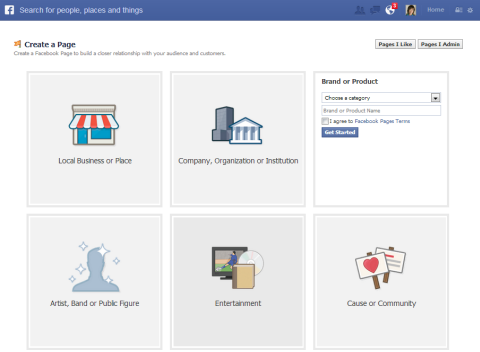 Then you have to create facebook page and the name of page must be your company or product name. 1. Open your browser and type “www.facebook.com” and give your user iD and password and click on login. 3. After that you have to choose that how to which type of page do you want to create and if want to create a business page. Then choose ‘Local business’ or ‘Company, organization’ . 4. After clicking on Company you will get a page like below. You have to category that which type of business do you have. 5. Below the category menu you have to enter the company name and click on ‘Get started’. After clicking on Get started a page like below will come. 6. In 1st blank space, you have to give short description of your company. If you have created a website related to your company then you have to enter the website url there. Below that website url two radio buttons are there by the name of ‘yes and no’. If your company is a real one then you have to click on yes button otherwise click on no button. After that click on “Save Info”. After clicking there a page like below will come. 7. In this step, you have to set a profile picture on your page. For this you have to click on ‘Upload from computer’. After that you have to choose a picture from your compter and click on ‘Save Photo’. After that you have to click on ‘Skip’ 2 times. You will get a page like below. Your facebook page has been created. In next post, I will show that how to increase likes on your facebook page.